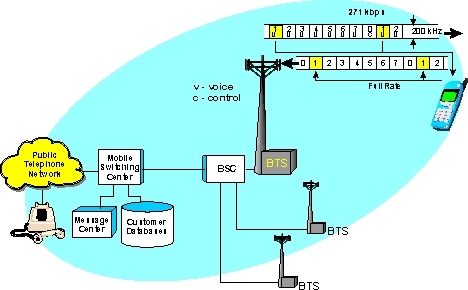 This diagram shows that the GSM system uses a single type of radio channel. Each radio channel in the GSM system has a frequency bandwidth of 200 kHz and a data transmission rate of approximately 270 kbps. This example shows that each radio communication channel is divided into 8 time slots (0 through 7). This diagram shows that a simultaneous two-way voice communication session requires at least one radio channel communicates from the base station to the mobile station (called the forward channel) and one channel communicates from the mobile station to the base station (called the reverse channel). This example also shows that some of the radio channel capacity is used to transfer voice (traffic) information and some of the radio channel capacity is used to transfer control messages. This figure shows the field structures of the normal burst used in the GSM system. This diagram shows that the field structure is different for the normal burst, synchronization burst, and the frequency correction bursts. The fields transmitted during the normal burst include initial tail bits (ramp-up time), training sequence, flag bits, user data bits, final tail bits, and guard period. This diagram shows that the first 3 bits of the time slot are dedicated to the gradual increase of transmitter power level (ramp-up). For the normal burst, this is followed by the information (user data) bits. The flag bits indicate if the normal burst has been replaced with FACCH signaling information. This diagram shows that some of the bits in the center of the burst are used as training bits (to allow equalizer training). At the end of the transmitted burst there are tail bits (for error protection) and 3 guard period bits that are used during the gradual reduction of the RF transmitter signal (ramp-down). This figure shows that GSM FACCH signaling replaces (steals) speech frames and replaces them with control information. This example shows the FACCH messages is divided and transmitted over 8 sequential channel bursts and that the speech information that would normally be transmitted is discarded. When received, the FACCH message is reassembled into its original message structure. -Serving General Packet Radio Service Support Node (SGSN). .
Mr. Lawrence Harte is the president of Althos, an expert information provider covering the communications industry. He has over 29 years of technology analysis, development, implementation, and business management experience. Mr. Harte has worked for leading companies including Ericsson/General Electric, Audiovox/Toshiba and Westinghouse and has consulted for hundreds of other companies. Mr. Harte continually researches, analyzes, and tests new communication technologies, applications, and services. He has authored over 100 books on telecommunications technologies on topics including Wireless Mobile, Data Communications, VoIP, Broadband, Prepaid Services, and Communications Billing. Mr. Harte holds many degrees and certificates including an Executive MBA from Wake Forest University (1995) and a BSET from the University of the State of New York, (1990). Mr. Harte can be contacted at LHarte@Althos.com. Mr. Bromley is the Vice President of Training for Phoenix Global Support, a training company who specializes in several modern communications technologies. He has over 24 years of communications experience as a user, trainer, and consultant to multiple government agencies. Mr. Bromley has retired from the U.S. Army after serving over 20 years of active duty in the intelligence community. He has brought his communication knowledge and real-world experiences with him and now uses them to educate the people with a need of this knowledge. He continues to research, learn, and develop new training which keeps Phoenix Global Support ahead of the technology world. Mr. Bromley holds a Bachelors in Information Technology from American Intercontinental University (2005). Mr. Bromley may be contacted at BBromley@pgsup.com. Mr. Davis, Phoenix Global Support�s Chief Operations Officer is also a military veteran with over seventeen years of real-world communications experience for multiple government agencies. He has continued researching and instructing the latest wireless technologies for nearly two years. Today, Mr. Davis maintains multiple relationships with end users of these technologies to ensure that Phoenix Global Support meets each customer�s requirements for training and education. Mr Davis may be contacted at MDavis@pgsup.com. This book starts with the system components and basic services that the GSM system can provide. You will learn that the key types of GSM devices include single mode and dual mode mobile telephones, wireless PCMCIA cards, embedded radio modules, and external radio modems. You will then discover the different types of available services such as voice services, data services, group call, and messaging services. Explained are the physical and logical radio channel structures of the GSM system along with the basic frame and slot structures. Described are the fundamental capabilities and operation of the GSM radio channel including channel coding, modulation types, speech coding, RF power control, and mobile assisted handover. You will learn how each GSM radio channels has 8 time slots per frame and that some of these are used for signaling (control channels) and others are used for user traffic (voice and data). Because the needs of voice and data communication are different, you will discover that the GSM system essentially separates circuit switched (primarily voice) and packet switched (primarily data) services. Described are key functional sections of a GSM network and how they communicate with each other. You will learn how and why GSM is evolving into 3rd generation broadband systems including GPRS, EDGE, and WCDMA.